Are you ready for another vampire? Starting 8th July 2013, the new anime series “Blood Lad” will become the latest tale of the bloodthirsty creatures from Transylvania. The story is known from the homonymous manga by Yuuki Kodama that is being published in Young Ace magazine since 2009. The character design for the anime is handed to Kenji Fujisaki, who is also chief animation director. 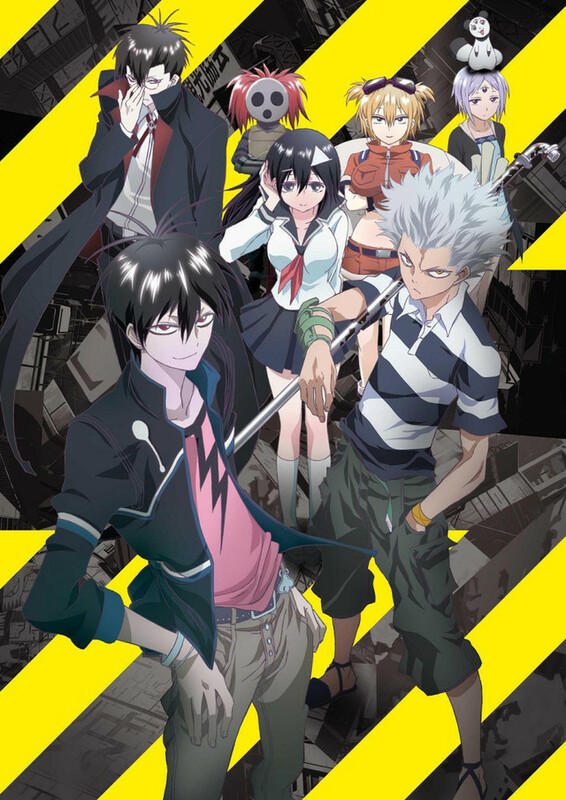 The production team comprises Brains Base; Blood Lad Production Committee and Kadokawa Shoten. Story wise, the young vampire Charlie Staz Blood (strongly reminiscent of Rin Okamura) is a big boss in the Daemon World who (as a lot of us, who read this site) has a crazy obsession with all things Japan. When he meets young Fuyumi, who is in fact a ghost, he foresees an opportunity to wander around the human world, while helping her to receive her life back. As you may guess, you will meet a lot of crazy fun characters along this journey. Staz Charlie Blood is a mighty vampire; a respected and feared district boss in the Daemon World. Even though he’s of high descent, he has split from his family at young age after a serious confrontation with this older brother Braz. Able to heal his wounds quickly and neutralise weaker daemons, Staz rules over the Eastern District. Nevertheless, the young vampire has a deep secret – he’s a pure blood otaku and cannot contain his fascination to everything “Made in Japan”. Fuyumi Yanagi is a bubbleheaded girl from Japan that lost her life after wandering into the Daemon World and being eaten by a carnivorous plant. She fascinates Staz because she can tell him a lot about what he would like to know most – manga, anime and video games… Please be prepared, though, as she’s not your ordinary Earthling. Wolf is the son of The King of the Demon World, who abandoned him as a child for not being of pure blood. He’s a powerful fighter and a long-time friend of Staz, whom he met as a kid. When he’s highly agitated, Wolf tends to grow claws and a snout. Bell Hydra is a great sorceress who possesses a gateway connecting Hell and Earth. Fuyumi and Staz use it when crossing over and manage to attract Bell’s attention. Fun and goofy, she walks around with her huge backpack and would like to help Staz to unleash his full powers. Braz D. Blood is Staz’s older brother who lives in the family estate. He has the power of blood manipulation that allows him to shapeshift and move blood from distance. When Staz was a little boy, Braz sealed most of his power by shooting him through the heart, claiming this is for the boy’s protection. Liz T. Blood is the judge of the Daemon World. Her duty is deciding between innocence and guilt and choosing punishment for the accused. Being the younger sister of Staz, she grows jealous of him but gradually grants him and Fuyumi her affection. Deku is Staz’s main assassin in the Eastern District of the Daemon World. Mimic Yoshida is another of Staz’s enforcers. His special power is to mimic any appearance. As Yoshida is working for Staz and has deep respect for his powers, he’s now using his skill to act as his boss’s replacement in the Eastern District. Saty is the quiet owner of the “Third Eye” café. You won’t hear her speak but be careful as she has a special collaboration with another magic master. Mamejirou is a strong and special magical creature that can communicate and combine powers with Saty. Thanks for the detailed preview. I really wondered what to watch this July and this might be it. Sounds funny and action-packed. I hope it won’t disappoint. I would really like to watch this anime. If it look like Ao no Exorcist – that’s even more awesome! Belle looks like Shura and Staz like Rin, Fuyumi is Shiemi; Wolf is Ryuuji. Not to mention Braz – the usual strong and reliable megane otooto-san Yukio. Nothing original. Having in mind both manga started in 2009, I guess this is just fashion. Still, if this is as successful as Ao no Exorcist was, the producers will be happy. Thank you for the acknowledgement, Google Girl. What a great anime! Thank you for the great choice for preview! Love it!!! !